Soothe your sugar cravings with the Hurraw! Chocolate Lip Balm; an ultra-hydrating formula that cares for skin using premium organic, vegan and raw ingredients. The super smooth balm is enriched with a sweet, skin-loving blend of Coconut Oil, Cocoa Seed Butter and Jojoba Seed Oil, which deliver a nourishing veil of hydration to eliminate dryness and ensure lips feel comfortable. 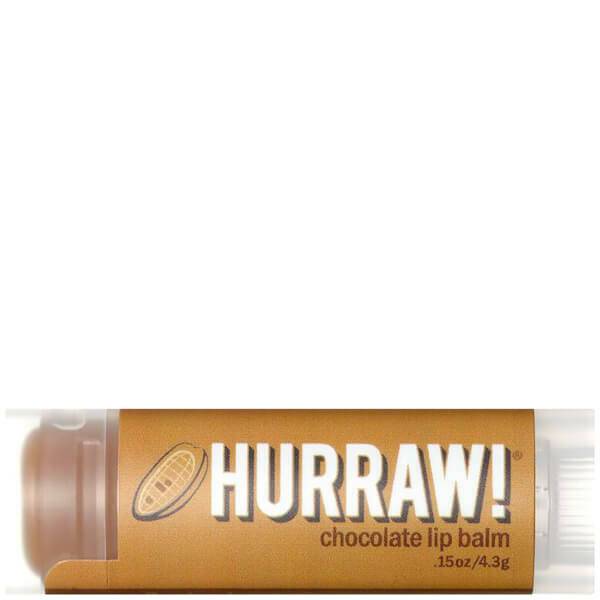 Finished with a generous dose of unsweetened raw chocolate, the creamy formula reveals moisturised lips that are scented with a delicious chocolate aroma. Prunus Amygdalus Dulcis (Sweet Almond) Oil, +Euphorbia Cerifera (Candelilla) Wax, *Cocos Nucifera (Coconut) Oil, *Simmondsia Chinensis (Jojoba) Seed Oil, *Theobroma Cacao (Cocoa) Seed Paste, *Theobroma Cacao (Cocoa) Seed Butter, *Ricinus Communis (Castor) Seed Oil, Olea Europaea (Olive) Fruit Oil, Organic Flavors, *Vanilla Planifolia (Vanilla) Bean, Tocopherols (Sunflower). *Organic & Cold Pressed. Smells amazing, feels really hydrating and nourishing without being sticky. Love the shape of the packaging, makes it easier to store and take out with me. Must-have lip balm!